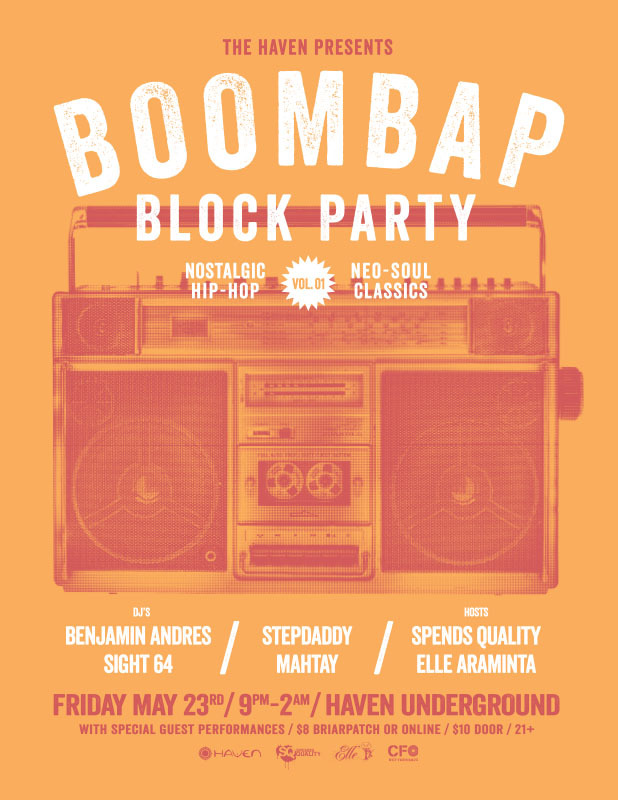 Boombap Block Party is a new monthly party series at the Haven Underground in Nevada City, featuring nostalgic hip-hop and neo-soul music. Each month will feature local and out of town artists, with DJ’s and performers bumping through the club’s Funktion 1 sound system. Local MC’s Spends Quality and Elle Araminta will be hosting the evenings, along with special guests. This event series is aiming to bring together the community, like a classic block party, to share their collective love for urban music, dance, and art while offering a space for artists and enthusiasts to shine. The first installment of Boombap Block Party (volume 1) will be held this Friday, May 23rd, from 9 pm – 2 am at the basement venue in downtown Nevada City. DJ’s Benjamin Andres, Stepdaddy, Mahtay and Sight64 will be playing choice tracks to keep the dancefloor moving, while Spends, Elle and friends wield the microphone for the evening. Presale tickets are only $8 at the Briar Patch co-op, and $10 at the door. ← Another New Music Video Out Now!! !